I’ve long posited that the Who’s Quadrophenia is the greatest rock album of all time. The 1973 double-disc captured the British rock quartet at its creative peak, firing on all cylinders, and—thanks to Pete Townsend’s songwriting skills—told a thoroughly engrossing tale of a young man’s struggle for identity amid the Mods vs. Rockers turmoil of 1960s England. Fans of the world’s greatest rock album got a special treat back in 2011 when it was released as a deluxe-edition boxed set, complete with previously unheard demos, a hardcover book, and various other goodies. 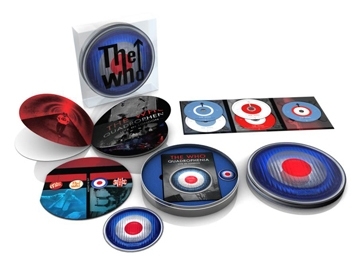 The treats for Quadrophenia freaks continue this Tuesday (June 10) with the release of Quadrophenia: Live in London, which documents the Who’s live performance of the entire Quadrophenia album at London’s Wembley Arena last year. Of course, the only actual drawback about a Who Quadrophenia concert recorded last year is that it doesn’t include the fabled rhythm-section of drummer Keth Moon and bassist John Entwistle, who died drug-related deaths in 1978 and 2002, respectively.